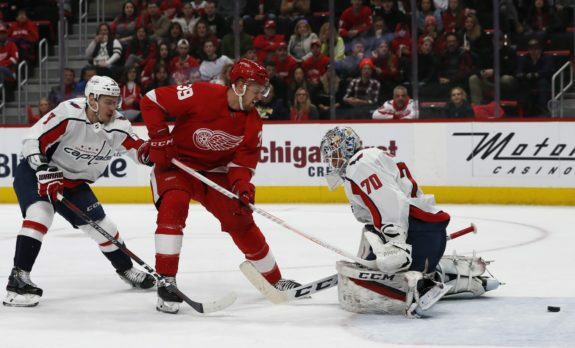 DETROIT — Michal Kempny scored with 3:52 remaining, and the Washington Capitals snapped their three-game losing streak with a 3-2 victory over the Detroit Red Wings on Sunday night. Tom Wilson and Travis Boyd also scored for the Capitals, who overcame another fruitless night for their power play and improved to 9-0-2 in their last 11 games against Detroit. Anthony Mantha and Filip Hronek scored for the Red Wings. The Capitals trailed 2-1 heading into the final period, but Boyd tied it off a pass from Alex Ovechkin. Goalie Jimmy Howard nearly made the save sliding from right to left, but the puck made it through. Kempny’s winner came on a wrist shot from the blue line that sailed through traffic and past Howard. The shot may have taken a deflection off Detroit’s Tyler Bertuzzi, who was trying to pressure Kempny. The Capitals won the Stanley Cup last season on the strength of a dynamic power play, but that unit is now 1 for 31 over the past 10 games after four more empty opportunities Sunday. Detroit wasn’t any better, though. The Red Wings were 0 for 3 and were unable to convert after T.J. Oshie took a penalty with 2:47 left in regulation. Washington opened the scoring when Wilson scored after a scramble in front of the net. Evgeny Kuznetsov was able to control the puck and made a slick pass to Wilson, who scored from a sharp angle. Mantha, in his second game back from a broken hand, was impressive throughout the first, and he tied the game with an unassisted goal with 5:52 left in the period. Mantha stole the puck at the Washington blue line, skated in and beat goalie Braden Holtby with a backhander between the pads. Hronek put the Red Wings ahead in the second when he redirected a nice pass from Larkin past Holtby. NOTES: Wilson, who began the season on a lengthy suspension for a hit during the preseason, now has 12 goals in 22 games. His career high is 14. Capitals: Host Philadelphia on Tuesday night. Red Wings: Host Montreal on Tuesday night.